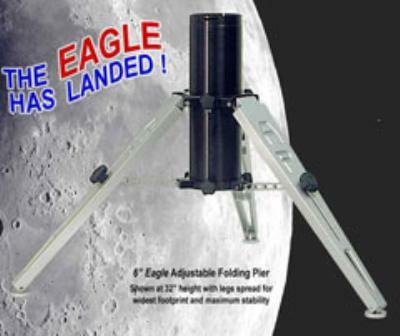 The new Astro-Physics 6" Eagle Adjustable Folding Pier is a versatile work-of-art as well as a totally practical tool for the advanced imager. The one piece assembly sets up quickly in the field and allows adjustment of pier height, leveling of the mount, and eases the process of polar alignment. The practical height range of the pier is 24" to 36". Adjustment is made by moving the center column tube up or down within the two inner ring assemblies and by moving the legs in toward the center. Adding the optional 8" extension piece that attaches to the top of the pier gives a total practical height of up to 44". The 6" Eagle is a breeze to set up and adjust. The included carrying strap makes transport to and from your dark site easy. Click the button below to add the Astro-Physics 6" Eagle Adjustable Folding Pier to your wish list.